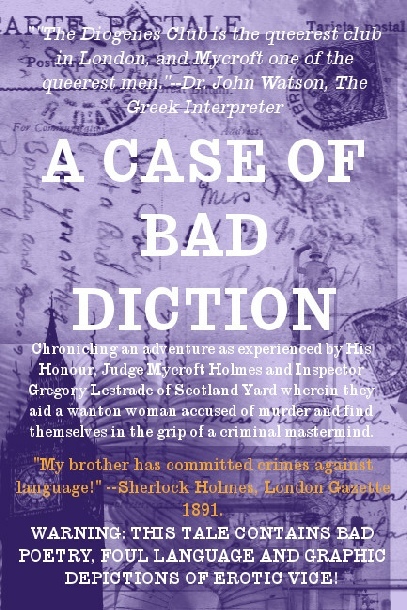 While dealing with his mad brother and the psychiatrist profiting from Sherlock's delusions, his Honour, Judge Mycroft Holmes works closely with his live-in lover, Inspector Gregory Lestrade, in finding justice for an innocent young female prostitute accused of murder. This book by far has been the most fun I’ve had writing to date and I do have a long plan in mind for its characters and themes (a whole eight books worth, spanning over the early twentieth century and ending during the start of the Great Depression). I am a huge fan of Sherlock Holmes and after having read some truly inspired Mycroft/Lestrade works, I had to dabble in the genre of unlocked fictional works myself. All of the brilliant Arthur Conan Doyle’s works are now in the public domain and thus this effort of love is now allowed to exist in public. I’ve always had a fascination with Mycroft and with the idea of Dr. Watson as an unreliable narrator. I kind of ran with it here, and I have admit, am now a tad obsessed, as most Holmesians become.